Sumazau is a generic term for a genre of music and dance of the Kadazan of Penampang District, Sabah. Traditionally, the sumazau was a sacred dance accompanied by distinctive gong music that was performed as part of religious ceremonies such as monogit, and those associated with rice farming, weddings, and various other obligatory rituals. The sumazau musical ensemble played using six hanging gongs, and a drum is called sompogogungan. When the sompogogungan plays the sumazau beat in ritual contexts, its sound is said to bridge the human and the spirit worlds. The dance itself, the sumazau, functions symbolically to cleanse and cure illness; the dancers embody the spiritual while simultaneously offering rice and rice wine to the spirits. Social change and development have made these traditional sacred practices less important in modern-day society. Nevertheless, sumazau continues to serve as a powerful identity symbol for the Kadazan. sumazau accompanied by the sompogogungan continues to be performed at village weddings and on other celebratory occasions, including special church events. Through staged performances featuring segments of the rituals choreographed for various secular events at district and state levels, Sumazau has become an iconic “living Kadazan heritage”. sumazau music with its distinctive rhythm has also influenced popular music and contemporary Kadazan Dusun songs. 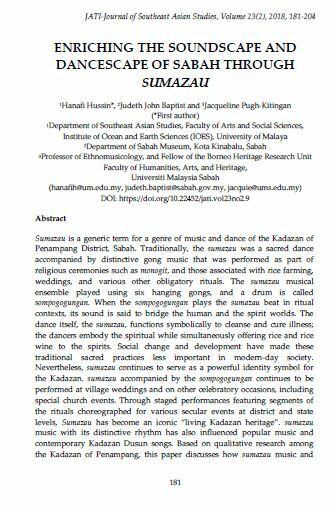 Based on qualitative research among the Kadazan of Penampang, this paper discusses how sumazau music and dance has been transformed from the sacred to the secular, from the traditionally private space to the public domain, where it enjoys a wider audience and participation as part of the intrinsic local popular culture of contemporary Sabah and Malaysia. Through concerted efforts to promote indigenous nationalism, sumazau music and dance have also become iconic cultural elements of the Kadazan as well as that of Sabah’s identity. HUSSIN, Hanafi; JOHN BAPTIST, Judeth; -KITINGAN, Jacqueline Pugh. ENRICHING THE SOUNDSCAPE AND DANCESCAPE OF SABAH THROUGH SUMAZAU. JATI - JOURNAL OF SOUTHEAST ASIAN STUDIES, [S.l. ], v. 23, n. 2, p. 181-204, dec. 2018. ISSN 2600-8653. Available at: <https://jati.um.edu.my/article/view/15318>. Date accessed: 26 apr. 2019. doi: https://doi.org/10.22452/jati.vol23no2.9.